MEN DET ER FANTASI, SELVFØLGELIG. OG SOM NOEN SOM KAN LESE TANKER, KAN JEG FORTELLE DERE AT FORBUDT FRUKT OFTE GÅR HÅND I HÅND MED DET. FOR Å VÆRE HELT TYDELIG, JEG SIER IKKE AT JEG VILLE HA SYNES DET VAR GREIT I DEN VIRKELIGE VERDEN. FAKTISK DET MOTSATTE, I TILFELLER HVOR JEG TROR AT ALDERSFORSKJELLEN VILLE HA VÆRT TIL SKADE. MEN FANTASI ER FANTASI. OG DU KAN IKKE KONTROLLERE TANKENE DINE. IKKE HELE TIDEN I HVERTFALL. OG JEG VIL TRO, SAMMENLIKNET MED HVA DU HAR SETT I VÅRE HODER…. ÅPENBART SÅ LESER JEG IKKE TANKENE DERES UTEN TILLATELSE, MEN SELV DE FÅ TANKENE SOM SLIPPER GJENNOM ER…USEDVANLIG RESPEKTFULLE MED DERE. DET ER EN AV GRUNNENE TIL AT JEG LIKER Å VÆRE PÅ LAG MED DERE. DET OG DE GODE HJERTENE DERES. SÅ JEG SETTER PRIS PÅ AT DERE FORSTÅR. MEN DETTE VAR NOE JEG DEFINITIVT, ABSOLUTT ALDRI SÅ FOR MEG AT JEG BLE Å DELE MED NOEN AV DERE. SÅ JEG FØLER MEG SIKKER PÅ AT JEG HAR OPPFYLT KRAVET. SÅ DA ER DET MIN TUR TIL Å STILLE NESTE SPØRSMÅL. VELG MEG. JEG VIL IKKE VÆRE SIST. BUT OF COURSE, IT’S FANTASY. AND AS SOMEONE WHO READS MINDS, I CAN TELL YOU FORBIDDEN FRUIT PRETTY MUCH GOES HANDIN-HAND WITH THAT. 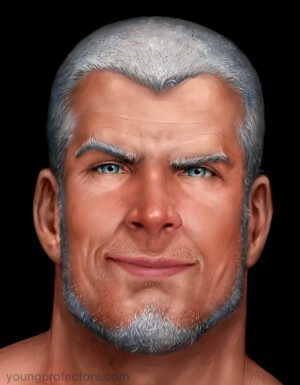 SO, JUST TO BE CLEAR, I’M NOT SAYING I WOULD EVER BE OK WITH IT IN THE REAL WORLD. QUITE THE OPPOSITE, IN CASES WHERE I THINK THE AGE DIFFERENCE WOULD CAUSE HARM. BUT FANTASY IS FANTASY. AND YOU CAN’T CONTROL YOUR THOUGHTS. AT LEAST NOT ALL THE TIME. AND I GUESS, COMPARED TO WHAT I’M SURE YOU’VE SEEN IN OUR HEADS…. OBVIOUSLY, I DON’T READ YOUR MINDS WITHOUT YOUR PERMISSION. BUT EVEN THE STRAY THOUGHTS THAT GET THROUGH ARE… UNUSUALLY RESPECTFUL WITH YOU GUYS. IT’S ONE OF THE REASONS I ENJOY BEING ON A TEAM WITH YOU. THAT AND WHAT GOOD HEARTS YOU ALL HAVE. SO I APPRECIATE YOUR UNDERSTANDING. BUT THIS DEFINITELY, ABSOLUTELY, WAS SOMETHING I NEVER EXPECTED TO SHARE WITH ANY OF YOU. SO I FEEL VERY COMFORTABLE I’VE MET THE REQUIREMENT. AND THAT MAKES IT MY TURN TO ASK THE NEXT QUESTION. PICK ME. I DON’T WANT TO GO LAST. We hit $8000/month over at the Patreon Page which means I just posted up the Full Monty Tsunami painting for Patrons! 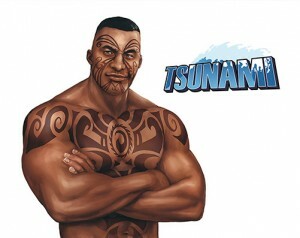 Painted by Marccus, the digital wallpaper features Tsunami in all his muscular, tattooed, Full Monty glory over white. And I really love what Marccus did with this — just beautifully rendered. And, because I got a couple emails from folks who said they misunderstood that $10+ Patrons were going to get high-res files of The Annihilator pin-up last month, I’ll also be including high-res files of the Full Monty Annihilator as well for $10+ Patrons, both with and without background, just for this month as well. So! Looks like Mitch wants to be asked the next question. Will he get his wish? And, if so, what will Commander ask him?